The 2017 season got off to a slow start for the Duntov team. 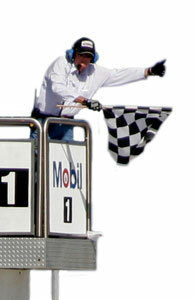 We missed Sebring in March for the first time since 2005. The cars we usually take were either under renovation or their drivers had business commitments that took precedence. 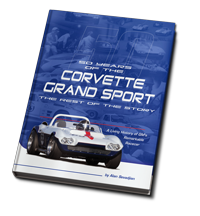 Six weeks later and the problem was not much better, as only Dr. Clair Schwendeman’s #37 Corvette had both car and driver ready and willing to run the Mitty. 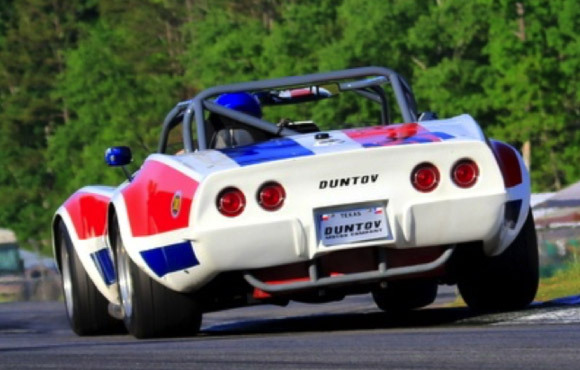 Road Atlanta is a special place for the Duntov team. Our first race here was in 1980 before the regrettable change in ‘the dip.’ In 1996, to bring the track into compliance with FIA safety regulations, then owner Don Panoz removed one of the fastest and hairiest turns in road racing and replaced it with a chicane. For the purest, it hurt, but the rest of the track remained unique and for this observer, unparalleled. Clair leads a pack through the esses that includes the Duntov prepared Camaro of Sam Lecomte. 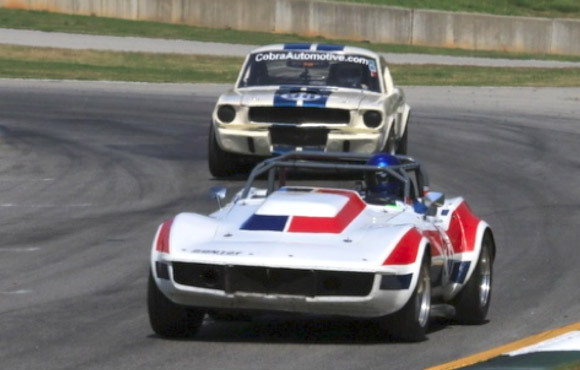 For Duntov, this Road Atlanta race was pretty forgettable. It had been a while since we had run an HSR race, and we weren’t exactly prepared for HSR’s lax enforcement of their rules. 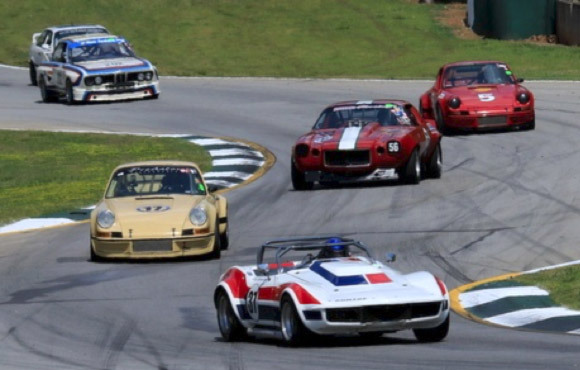 HSR has always been much more liberal in their car prep rules and enforcement than SVRA, and traditionally they have turned a blind eye at the Mitty. Long time SVRA technical guru Jack Woehrle took over HSR’s technical enforcement a few years ago and has tightened things up a bit, but not quite as much as we had hoped for or expected! Alan practicing for the enduro, here leading the very fast Mustang of Gary Moore. We brought Clair’s car exactly as it ran in its last race, the SVRA National Championships at COTA. Allegedly everyone else was running either big engines, or no ballast, or both. We ended up seventh in the International American race on Saturday, but that is all the racing we were able to get in as the enduro and the Sunday feature race were conducted in a heavy downpour. The Porsches loved it, and we were happy to let them have at it. Clair getting all there is at the top of the hill in Turn 3. 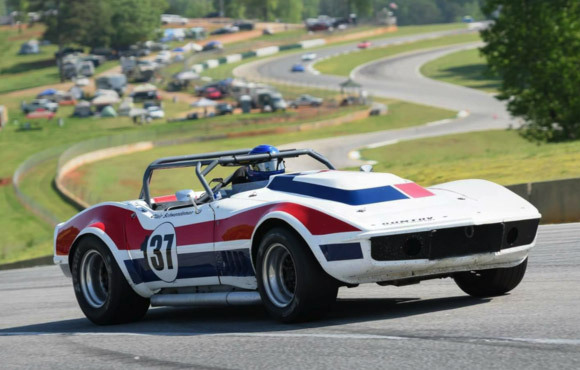 A classic view of Road Atlanta’s esses as Clair’s Corvette accelerates up the hill out of Turn 5.